• Failed to listen to its members. With the GOP disintegrating there is little to halt or slow the devolution of the United States into just one more failed socialist state, something Barack Obama has worked tirelessly to achieve, and which either Hillary Clinton or Bernie Sanders would continue. Donald Trump leads conventional Republican candidates in the primaries and caucuses, which surprises and confounds the party elite, who thought he would be a flash in the pan, and would soon fade away, leaving them to continue abandoning their party’s role in protecting the American way of life, and ignoring the concerns of their voters. This effectively demonstrates how badly they have misjudged the level of anger and disgust with the current state of their party that rank and file Republicans feel today, as well as the high degree of dissatisfaction they and a host of non-Republicans have with the federal government. Trump’s behavior is at once energizing and destructive. It has won him a large following, and at the same time has exaggerated the party’s fracturing, pitting candidates against him and against each other in an elementary schoolyard brawl. But his tactic of saying things others are afraid to say, and ignoring the stupid but daunting rules of political correctness, has energized millions of dissatisfied Republicans, and has attracted non-Republicans, including blacks and Hispanics, to his campaign. The “establishment” Republicans – those whose weak-kneed perspective has transformed the party to Democrat lite – are working to subvert the primary process, disenfranchising the Republican primary/caucus voters. The establishment’s behavior over recent years is precisely why things are as they are, and hardly anything could be worse than ignoring the plain message sent by the voters in the primaries and caucuses that substantial change in the GOP is needed. It is difficult to imagine that the Republican Party will be able to survive if it betrays the loud voices of those who make up the party telling them to man up, and still remain a viable political entity. A perfect example of the tone-deafness of the party elite is the blistering condemnation of Donald Trump by 2012 GOP presidential candidate Mitt Romney, who turned backflips to make Trump seem like the Devil incarnate. If that doesn’t seem strange, consider that during the campaign four years ago, following Trump’s endorsement, Romney effusively praised him, and then proceeded to lose the election by failing to be as strong in his opposition to Obama as he was in his praise of Trump. It is another tribute to the failure of the GOP establishment that it regards Romney’s foolish trashing of Trump more highly than the candidate now leading the party’s nominating process. She asserts that what is happening now is more serious and less reparable because it is not about political philosophy. But it seems that the party’s abandonment of conservative principles is precisely what this is about. By ignoring the increasing frustration of the rank and file over Republicans in Congress failing to stand up against liberalizing of government policies and recent executive branch excesses, the party elite set the stage for Donald Trump’s stunning dominance among those seeking the party’s nomination. Where Trump is concerned the party elite is damned if they do and damned if they don’t. If they allow the process to play out and he wins the nomination, someone believed by millions to be neither a Republican, a conservative or suitable to be president will carry the Party banner into the election. If they continue the plot to subversively prevent Trump from getting the nomination, they will alienate millions of otherwise dependable Republican voters. It seems likely at this stage that the Republican Party will endure, but not as a meaningful political force equal to the Democrat Party. 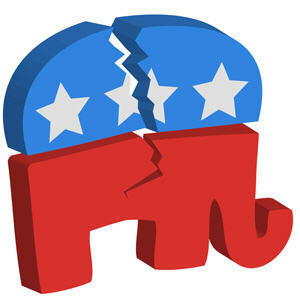 The Republican establishment will be left holding the tatters of a once-Grand Old Party while conservatives move on to greener pastures. Disaffected Republican voters and others dissatisfied with the status quo that might have stuck with or joined a conservative GOP now will seek an organization that honors and defends the U.S. Constitution not only in word, but also in deed. The question is whether without a viable opponent to Hillary or Bernie, or a split among those opponents, will it be possible four or eight years later to repair the damage likely to result from another liberal/socialist in the White House? I would vote for Trump. It's a wild ride, Steve. I will vote for the Republican nominee, Trump or whomever, because only the Republican can beat Hillary or Bernit (or whoever).